Perhaps I’m being a touch unkind, but whilst pointy-eared hero archetype Jak might have been the face of Sony’s marquee platformer at the turn of the 21st Century, he was never its real star. Even when they made him get a little mean, a wee bit evil around the edges, he was still rarely more than a stooge for the true hero, his side-kick Daxter, to bounce one-liners off. For better and for worse, the mainline sequels stuck stubbornly with Jak as their main protagonist but, five years on from the original, Ready At Dawn Studios (a modest though potent gathering of former Naughty Dog and Blizzard employees) engineered a PSP title belatedly handing the wise-cracking, hyperactive ottsel centre stage. I guess we shouldn’t have been surprised, but the end result is superb. One thing Daxter never loses sight of is that platforming is what it’s all about. It sounds blindingly obvious to spell it out in such terms, but strong level layouts are crucial in engaging the player, and so many of its peers seem to take it as read, forgetting that a 3D space with some nice scenery around the edges isn’t enough in itself (see Ratchet & Clank: Size Matters for a prime example of this). It’s packed with great features, and the majority of the time they complement the platforming side of things, and don’t act independently as a distraction. Naughty Dog’s entries had become muddled with half-hearted sandbox pretensions, combat racing and rickety shooting, making for platformers that in spirit weren’t very er, platformy. Daxter doesn’t make this mistake, and unlike some of its console brethren, there’s precious little filler. 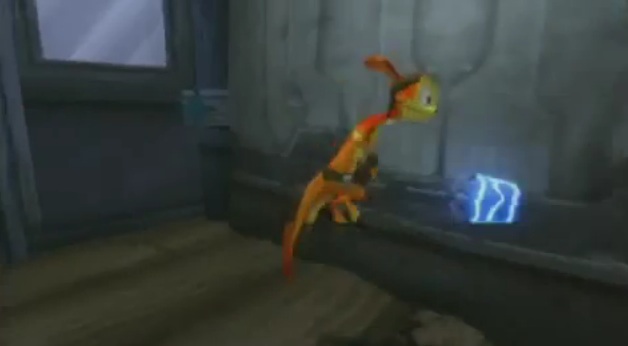 Daxter’s guise in the game is as a bug exterminator. Set in a mercifully very much compacted interpretation of Jak II’s metropolis, he travels to hotels, mines, construction sites and the like, killing bugs and retrieving the yellow gems they drop, a designated number of which leads to the completion of the level and the opening of the next. He’s armed with a fly-swatter, a variety of athletic moves and a pesticide-spraying weapon that later doubles as a flamethrower. It’s a typically ingenious tool with all sorts of uses, including clearing cobwebs, melting ice-blocks, turning valves and of course, barbecuing enemies. It even doubles as a thruster, granting the ability to glide for short periods, opening up a raft of possibilities for exploration. These elements are integral both to the challenge of the game and as a means of ensuring it remains compelling, with no two levels following the same pattern of design. The analogue nub controls really well and whether you’re negotiating a series of tenuous jumps, torching bugs or evading prison patrols and crawling through sneakily placed vents, it is a consistently high-quality adventure. Frailties that do arise are minor and relatively few in number. For as long as 3D platformers exist, the camera is going to be a thorn in the side and unfortunately there are times when it won’t rotate in enclosed spaces, and others when it moves just prior to a jump, leading to the odd ignominious death. In places, the city suffers from slow-down, though given the amount of detail and the fact it’s chiefly a hub linking the levels, this can be forgiven. The narrative is largely superfluous with the ending proving something of an anti-climax, and whilst the story has never been the primary reason to get involved with the series, a stronger supporting cast certainly wouldn’t have gone amiss. It’s an absolutely gorgeous-looking game though, an early demonstration of Ready At Dawn’s mastery of the hardware, and some of the best visuals ever seen on the PSP. The animation is fluid and Daxter looks particularly outstanding in the cut-scenes where you can see individual strands of his fur brisling, the quality is so good. The cartoony environments are chocked full of sumptuous, colourful detail and would have looked good on a PS2; the first-person view will be put to frequent use in admiring the settings, but it’s also useful for scouring for secrets and hidden areas; there’s a depth of design that marks it above its competition. Whilst Daxter is uncharacteristically quiet in the field of play, he’s up to his old tricks in the cinematics and his generally frenetic, mad-cap nature suits the game’s quirkiness. The dream sequence mini-games provide the funniest moments, amusingly and effectively spoofing famed film franchises. One instance sees the hero don a hat and whip in an Indiana Jones homage, with the aim being to hold off snakes and spiders. Others see him parodying scenes from Braveheart and Lord Of The Rings, but the best is the mock-up of The Matrix that sees the ottsel decked out in suit ‘n’ shades mimicking Neo’s martial arts, as he battles agents from all sides. Each mini-game is similar to the last, all revolving around following on-screen button prompts; but serve as useful practice for some of the computer hacking exercises later in the game. Staying true to Jak & Daxter’s collect ‘em up ethos, there’s plenty of rewards to be found for those willing to replay the levels. The games 1000 Precursor eggs unlock the aforementioned mini-games as well as concept art and videos, and various other, more imaginative extras, such as items of clothing for Daxter and codes to unlock wallpaper, videos and galleries on the game’s website. It isn’t a massive game, but there’s enough to keep you hooked for a few weeks. Daxter is an absolute must for PSP owners. Ready At Dawn have squeezed the most out the system, and in doing so have created a platform adventure that is both technically superior and beautiful to behold. Of greater significance is that it offers a far more extensive and rewarding portable platforming experience than nearly anything else of its time, with great controls and strong design meaning it can legitimately stand toe-to-toe with any of Naughty Dog’s PS2 outings.